My my... this time it seems that I'm compelled to step up! ;-D For real, I have to show off my curves soon! I ❤ it! Oh well, there's no such thing as free lunch, so I might actually have to work on them. Suffice it to say that I might have actually found the super perfect exercise routine that I will happily oblige myself to groove. This is actually a sticky post since I have yet to try it out myself (as soon as I find a work around schedule to plan my Manila trips). I promise to personalize my photos asap! ✌ But while doing my research on the fitness routine, you know just to make sure that I will happily commit to it, I fell in love with everything about it! It's a love at first sight! 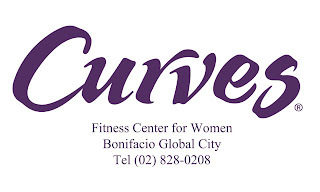 Curves is actually the largest fitness franchise in the world that is created specifically for women and it finds its home at Serendra, Bonifacio High Street. Here's actually what got my interest piqued... burn up to 500 calories in just 30 minutes (nice! ;-D) with Curves, because of its complete cardio and strength training workout. 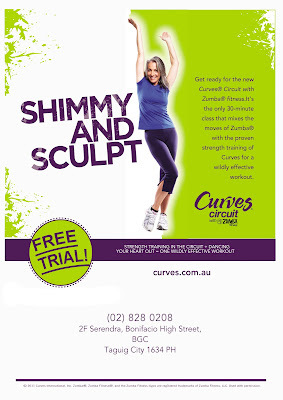 And there's more, Curves launched Curves Circuit with Zumba Fitness. "Curves Circuit with Zumba Fitness is the only workout that combines strength training and high-energy cardio for a complete 30-minute muscle-toning, fat blasting, party-in-the-circuit workout!" Curve Members who join the program gets free product, while non-members gets waived joining fee of Php 4,990. This is already something for naturally doing one's share of charity. To be able to expand its philanthropic reach, company donations would also be most welcome. For more information about Curves of Bonifacio Global City, located at 2F Serendra, McKinley Parkway, and the Curves Food Drive, contact Fe Abrihan at (02) 8280208, 0917 8708870, 0922 8170353, 0920 9499851 or e-mail to curves.bgc@gmail.com.